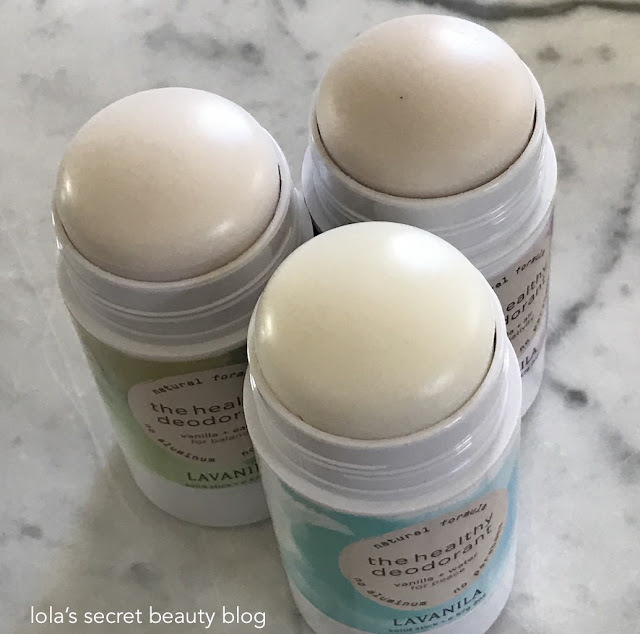 My go-to daily deodorant has been LAVANILA The Healthy Deodorant for many years, and I love them more than I can begin to describe. They are healthy, devoid of harmful ingredients, they smell lovely and they are very effective. Furthermore, they neither stain closing, nor do they leave a white residue on the skin. They are, in a word, perfection. I am delighted to tell you that they just launched the LAVANILA Elements Collection, available at Sephora, that is a, "collection of fresh, energizing deodorants where health and wellness collide." 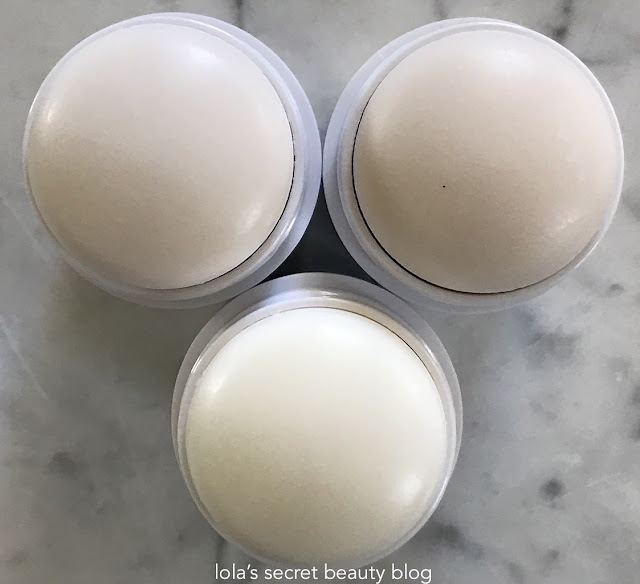 LAVANILA sought inspiration from the "core elements of nature — Air, Water and Earth" and these aluminum-free deodorants are "infused with carefully curated blends of pure essential oils to awaken our connection to the Elements and the immense power within them." Vanilla + Air for Creativity: "An uplifting, floral pairing of violet and rose, perfect for a budding artist or brainstorming session." This lovely light floral has a beautiful floral aroma that is punctuated by rose and violet, but it is neither too strong or sweet, nor is it powdery. Instead, the lovely fragrance sits close to the skin and has a refined and elegant floral scent. Vanilla + Water for Peace: "A calming blend of chamomile and jasmine ideal for yoga class or stressful meetings." This deodorant has such an extraordinary aroma that is best described as a sweet floral reminiscent of a warm ocean breeze infused with Jasmine and other light florals. Vanilla + Earth for Balance: "A warm and woody combination of patchouli and sandalwood that enhances focus and concentration." While its description might summon thoughts of a heavy woody scent punctuated by a pungent patchouli, this is a light, sweet and creamy woodsy scent infused with warm florals, and without any detectable notes from the patchouli. It has a depth and yet it isn't in the least bit overpowering. 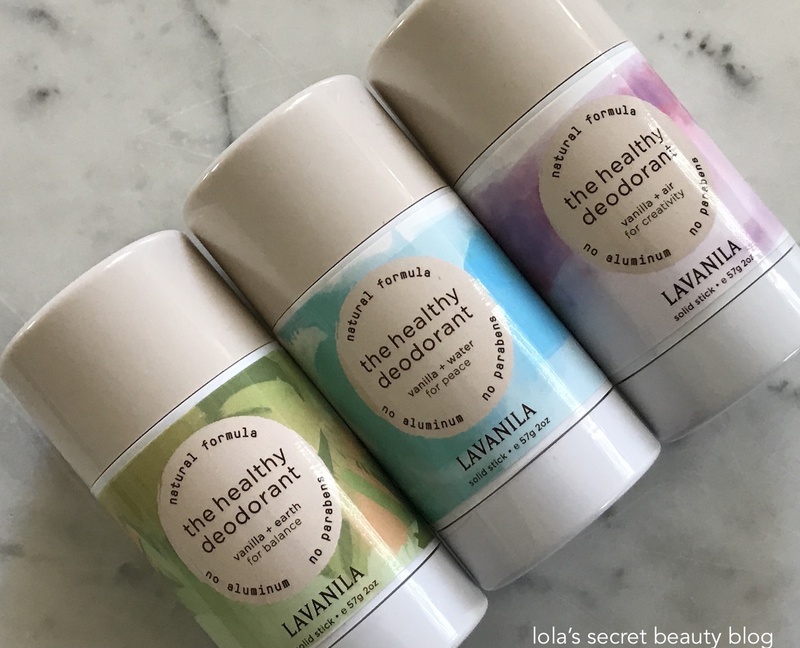 An aluminum-free deodorant collection from LAVANILA that delivers powerful odor protection while uniquely imparting a sense of wellness. This award-winning, aluminum-free odor protection is powered by proprietary technology and antioxidants for daily defense and nourishment. Each deodorant nourishes the underarm area while a special blend of essential oils imparts a unique sense of well-being. This collection is award-winning, vegan, cruelty-free, dermatologist recommended, and clinically tested. Ingredients: Aloe Barbadensis Leaf Juice (Aloe Juice, Water), Propanediol (Corn Derived), Zea Mays (Corn) Starch, Sodium Stearate (Coconut Derived), Silica, Carrageenan (Seaweed Derived), Stearyl Behenate (Coconut Derived), Citrus Medica Limonum (Lemon Peel Oil), Inulin (Artichoke Derived), Saccharomyces Ferment, Alpha-Glucan Oligosaccharide (Sugar Derived), Yeast Beta Glucan, Lonicera Caprifolium (Honeysuckle) Flower Extract, Usnea Barbata (Lichen) Extract, Valeriana Officinalis Root Extract (Valerian), Hydrastis Canadensis (Goldenseal) Extract, Melaleuca Alternifolia (Tea Tree) Flower/Leaf/Stem Extract, Lycium Barbarum Fruit Extract (Goji Berry), Vanilla Planifolia (Vanilla) Oil, Botanical Fragrance Blend. Formulated without Sulfates or Phthalates. $14.00 for 2 oz. from Sephora (Affiliate Links). How nice that there are several fragrances to choose from. I love this brand! I love this brand too, and these new scents are AMAZING! I just wish that they weren't limited edition! I noticed the nice new packaging right away. 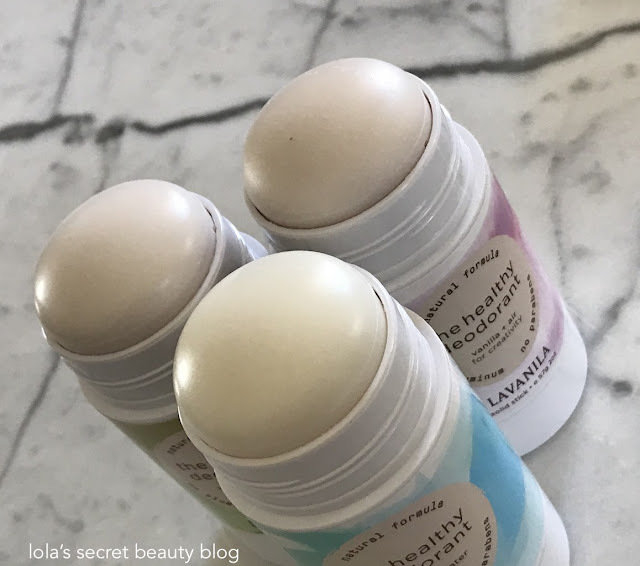 I've used other Lavanila deodorants before and enjoyed those too. These sound like they are a great earth day addition. The new labels for these limited edition deodorants are definitely quite pretty! These are perfect for Earth Day! This brand has the best scents! Being an Air Sign, of course the first one intrigued me! Gotta try that one out! I do too, and I highly recommend grabbing these before they sell out! I really wish that they weren't limited edition! I know Lavanila is very popular but unfortunately their deodorants don't offer me enough protection. It's too bad because I really love their scents! That's too bad! I love their scents as well!